The traditional view of the original settlements in the Americas has been that the people arrived at the continent from Asia during the last Ice Age when the world’s waters lowered enough to expose a bridge. 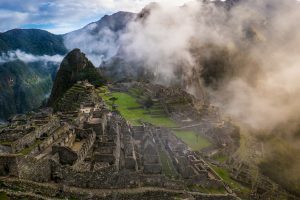 Recently this issue has become an area for debate because some archeological finds suggest a connection between the Americas and Europe as well. In any event, the peoples of the Americas were cut off from the rest of the planet by water around 10,000 years ago. In the isolation, the people who lived on the continent went through cultural transformations similar to those everywhere else on the planet. Mesoamerica is one of the regions that played an important role in the development of arts, sciences, and culture in t he Americas. Mesoamerica extends from central Mexico into Central America. People living in Mesoamerica have developed an elaborate writing system, advanced in astronomy, and biology, invented a complex calendar and sophisticated mathematical systems, providing scholars with a lot of material for research. The Maya have learned to work with metal and produced complex and exquisite objects and tools using gold, silver, and copper. Basketry and weaving have also become popular in creation of both functional and art objects. When it comes to architecture, Native Americans have learned to build multi-storied apartment-like dwellings, irrigation systems and canals. The first major art style in the Americas emerged starting around 1500BCE. Elements of this style include monumental stone sculptures, elegant ceramics, pyramids, plazas and ball courts. Present-day Mexican states of Veracruz and Tabasco became home to a number of Olmec ceremonial centers. Scholars think that these centers were residences of elite groups of rulers and priests and were supported by a large population of farmers that lived in villages around them. The presence of items made of obsidian and iron proves that the Olmec had extensive long-distance trade connections. One of the most important materials in this trade was jade, which was considered to be one of the most precious in Mesoamerica. The earliest ceremonial center has been discovered at San Lorenzo. It is estimated that it has been built around 1000BCE. It had a complex drainage system made of stones and exquisite architectural features such as basalt columns, a ball court, and a stone-carving area, were basalt sculptures were produced.